A text by guest blogger Lisa Anderson. 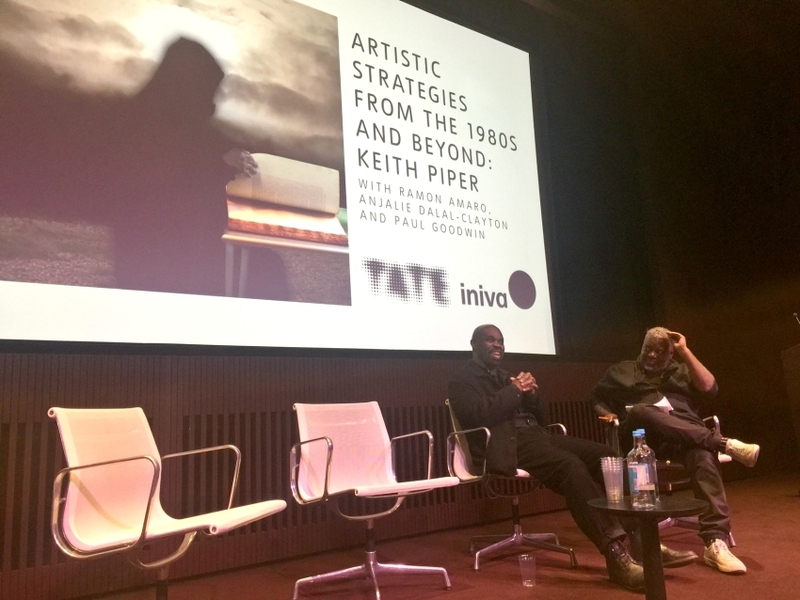 At the start of March, Iniva partnered with Tate Modern to present the first of three discussion events exploring artistic strategies from the 1980s and beyond, beginning with a focus on Keith Piper’s work. As a curator and consultant with a special interest in the use of digital technology to both promote and produce emerging contemporary art, it was fascinating to hear fresh framings of Keith’s pioneering digital arts practice, which shed new light on how he had employed the mythological/folkloric concept of the ‘trickster’ to inform his radical arts strategy. The event began with a video essay by Piper that introduced excerpts from his latest work, ‘Unearthing the Banker’s Bones’: a three-screen video installation that reflects Piper’s provocative use of digital media to explore his interest in post-apocalyptic and speculative science fiction, and the act of deconstructing the present through projections of an imagined future. The video cast us into thework’s dystopian future of social and economic collapse; a landscape “ravaged by the aftermath of humanity’s excesses and destructive paranoia”, where we encountered Piper’s trickster-esque trope of the robot – in two distinct guises – as a metaphor for the black body as possibility. The first, in the likeness of a Mars Rover robot, is named after the African-American abolitionist and women’s rights activist, Sojourner Truth. The Sojourner robot is tasked with the redemptive intellectual task of toiling across the invented hostile terrain to generate knowledge that might save humanity. The second is a shapeshifting, android figure named Surmanakin taken from the Islamo-futurist poem ‘Beyonder’ by Jalal Nuruddin, a founding member of the influential African-American group The Last Poets. The Surmanakin android has been sent into the future to locate, excavate and decode the capitalist secrets held in the banker’s tomb, to reveal an alternative, liberatory taxonomy of knowledge, and to challenge the very systems of knowledge that these structures are built upon. 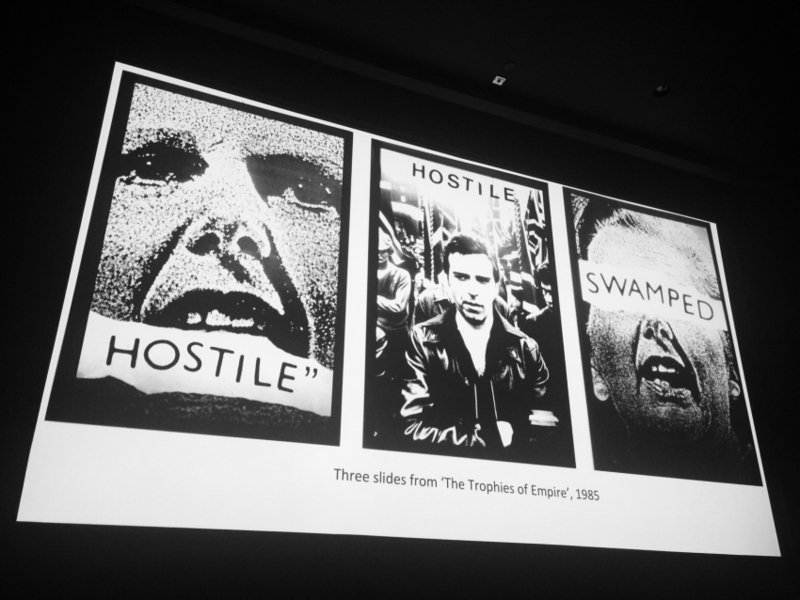 Anjalie Dalal-Clayton’s panel presentation, Technological Journeys in the work of Keith Piper, provided an insightful contextualisation of how the artist began to use of pre-digital technologies as a founding member of the 1980s radical Blk Arts Group. She explainedhow photocopier and slide projector technologies had helped to unbridle his work from the object-oriented domain of modernism, whilst empowering him to explore counter-cultural narratives in new definitive ways. Dalal-Clayton also referenced the irony in the recent trend of some millennial artists being drawn towards the same ‘vintage’ digital technologies eagerly adopted by Piper in his early career for their avant garde potential. In contrast, Piper shared with slightly disheartening resignation, how the inevitable expiration of these technologies had rendered swathes of his archive into irretrievable treasures, which led me to reflect on the time-restricted strategic potential of works made in such a rapidly developing medium. Piper also mentioned his admiration for emerging artists such as Larry Achiampong and David Blandy, whose exciting works are pioneering experimentation and critical engagement with the frontiers of gaming technology. In ‘Finding Fanon Part 2’, the artists disturb and repurpose the environment of Grand Theft Auto to create a video work that explores the postcolonial subject’s relationship to digital technology and media. In a similar way to Piper, the fictional characters in this digital realm assume profiles that take on a transformative potential, as way to consider Frantz Fanon’s ideas on identity and political agency in the era of globalisation. Ramon Amaro’s presentation, appealed to the audience to develop creative strategies that might counter the insidious effects of technology and calculation in our everyday lives. Referring to Piper’s thinking about the visible otherness of the robot of science-fiction and the black subject, ‘both perceived as possessing a physical configuration which positions them as either compliant servant or non-compliant monster,’ Amaro went on to make the link to Fanon’s writings on servitude and the ultimate negation of the black body under the epidermal gaze of whiteness. He then took a step further to contrast this negation with the legitimisation of surveillance and violence upon black subjects through the operation of data-driven technologies that quantify and organise black life. Amaro’s presentation highlighted examples of where technologies driven by biased algorithms resulted in the racist controversies surrounding Google’s Adsense, where Google’s advertising was accused of racial profiling; Microsoft’s Tay, the artificial chat-bot that was corrupted by other Twitter users to send out racist slurs; and where it has been suggested that by research that the company’s technology was found guilty of negative racial and gender profiling. In considering these examples from the perspective of the relation between the body and technology and the “co-production of either from within the other”, I found myself implicated, as both a producer of and one who is subject to the effects of big data. Like Amaro, I was left inspired by Piper, to consider how one might negotiate the risks, responsibilities and opportunities that the digital realm offers for radically progressive cultural production, at a time when the power of art to counter the narrowing dominant political discourse could hardly be more urgent. The talk unpacked Keith as pioneering intellectual, maker, knowledge excavator, cultural producer, precocious art trickster, whose work continues to be ever-relevant for emerging generations of artists and curators tackling questions of identity, power and representation through the medium of digital technology. 1 Keith Piper, Robot Human: Interactive art work and installation 2001-2017. 2 Frantz Fanon, Black Skin, White Masks. Lisa Anderson is a curator and founder of @BlackBritishArt (An online platform to promote and celebrate contemporary Black British Art) participating on the ICF (International Curators’ Forum) Beyond the Frame programme.